The other week we took our kids to an Indian/Mediterranean restaurant for dinner. I usually stay away from combo places like that, but this place in the University District just rocks. The indian food is fantastic, and the humus is amazing, go figure. We ordered mostly indian food, except that my older daughter was not sold on the chicken tandoori or chicken tikka masala – she wanted to try the mediterranean food. So, she ordered a gyro plate – and except for the tahini sauce drizzled all over the meat, it was a winner. On the side, she was served – no joke – at least an entire package of pita bread. We ended up taking home a lot of food that night (we ordered way too much because we weren’t sure what the kids would like – turns out the chicken tikka masala was the big winner of the night) – and I decided to take home the pita bread as well. I knew they wouldn’t serve it again, and heck, there was a ton of it that would have gone to waste. The next few weeks went by, and I kept staring at the pita bread in the refrigerator – wondering when I was going to use it up. 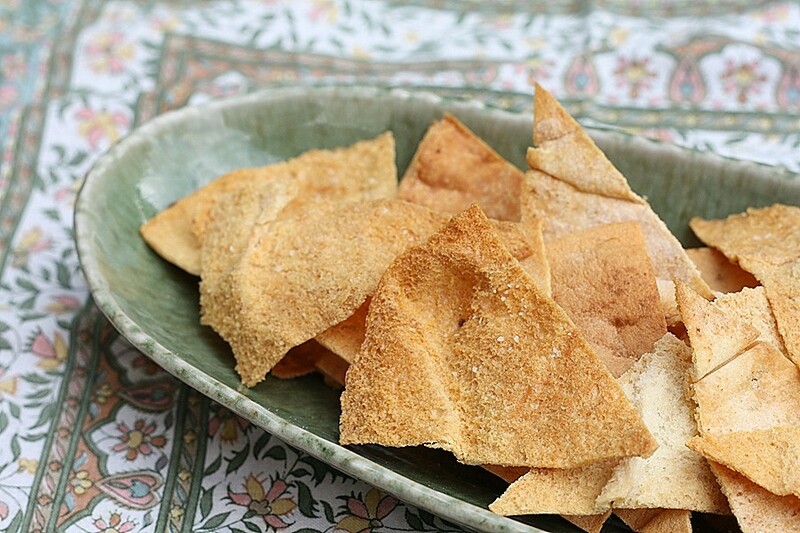 Then I remembered what my grandmother used to do – make pita crisps! I decided to try something new, and spray them with olive oil spray, instead of brushing them – it was much easier, and much healthier. They were delicious! In fact, they didn’t even last long enough to put in the pantry – they were gone almost instantly. We just ate them plain, but they would have been amazing with this, this or this – the possibilities are endless! Preheat the oven to 350 degrees. Line the pita triangles onto a cookie sheet lined with foil. Spray the pita with the olive oil (or Pam) – then sprinkle with kosher salt. Bake for around 10 minutes or until lightly golden – but keep a watchful eye – once they start browning they go fast. ooh we love pita chips–i need to try this! I love making these with a sprinkle of onion powder. Or by flavouring some oil with garlic and maybe a little lemon zest and then brushing it over the wedges before baking. I don’t even need dip at that point. Try chili powder, or basil & garlic powder – even just seasoning salt is great – I make these a lot. Which Indian restaurant did you go to? We might have to check it out. Cedars – it’s the best!